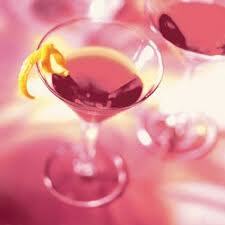 THE MARTINI CHRONICLES: Martini Thursday...the Cosmopolitano! So...last weekend, I journeyed to Chicago to attend a gala for a wonderful organization. After dinner, my friend and I headed over to restaurant to find more food (there's never enough food at these galas!) and dessert. As I am always on the lookout for martini recipes, I immediately dived for the drink menu...and it did not disappoint! I stumbled upon the Cosmopolitano, a drink that quickly caught my eye because it included both vanilla and amaretto, two of my favorites. And when it arrived, it was great! It was like dessert in a glass, and I instantly knew that I had to share the recipe with you all. So here it is! 1. In a shaker, combine Vodka, Amaretto, Cranberry Juice, Lime Juice, and Ice. Shake! 5. Remark to a nearby spouse, friend, and/or pet how delicious the Cosmopolitano is, and how glad you are that you tried the recipe. 6. Go to your favorite electronic device and go to the Martini Chronicles. 7. Leave a comment underneath this post and exclaim your love for the Cosmopolitano.